Raising up leaders among orphans, vulnerable children, widows, and the local church. His Voice Global is called to work in areas of the world with high populations of vulnerable women and children to partner with local leaders to fulfill their vision to care for, educate, and encourage the vulnerable women and children in their area. We currently have partnerships in South Sudan, Kenya and Uganda. South Sudan is the newest country on earth and also one of the poorest. A civil war has been underway for almost five years, and now it is up to the leadership for each side to broker a badly needed peace. Unfortunately, orphans, vulnerable children, and widows in these countries are among the most affected. In Maai Mahiu, many women and children live in unhealthy and dangerous environments. Prostitution is one of the primary sources of commercial business because of the location and immense poverty. Restoration and renewal are desperately needed. Uganda has been the recipient of nearly a million South Sudanese refugees, resulting in stresses for them and Uganda’s own citizens. 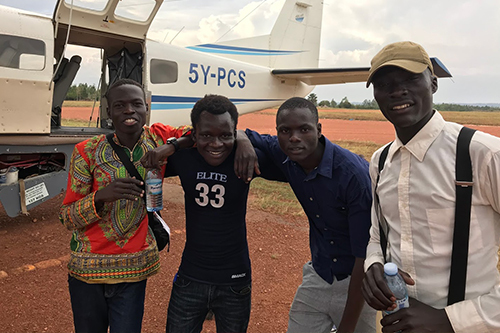 As refugees spilled into Uganda, “His voice” was needed there to provide opportunities for college educations for the students in our care, as well as an opportunity to build a Discipleship Center for students.